Our commercial / industrial aluminum wheelchair ramp system meets ADA, IBC and UBC standards. The information below, and on subsequent pages, should address any questions you may have about the construction and commercial viability of our wheelchair ramp system. In the event that you cannot find the information you're looking for or if you need a quote for a ramp system, you can call us at 1-877-258-7423 and we'll do our best to get you what you need. All commercial ramp projects will come with submittals for your building dept. as well as with drawings for footer placement should they be required. Stamped drawings are also available for an additional fee. You can E-Mail drawings for your project to us or fax them to 303-703-4879. If you do not have a drawing and need assistance with your layout just give us a call and we'll design one for you based on your specific needs. See more photos of the commercial ramp & stair system. -Aluminum extrusions are either 6061-T6, 6063-T52, or 6005-T5 aluminum alloy. -Aluminum sheet material is 5052-H32. -All mechanical fasteners are 18-8 stainless steel. -Walking surfaces are designed to carry a uniform live load of 100 pounds per square foot and a concentrated vertical load of 300 pounds in an area of one square foot. -Ramp sections are fabricated in typical 8’ and 10’ lengths. Custom lengths can be fabricated as requested. -Wheelchair ramps can be of any length to meet ADA compliance, a resting platform is required for every 30' of ramp. -Meets all code requirements for load specifications. -Ramps can be designed in an endless number of Layout Configurations. -Wheelchair ramps, platforms and stairs are ADA, IBC and UBC compliant. 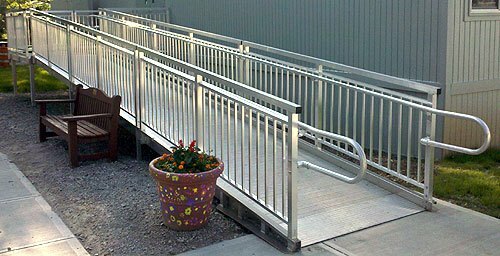 In order to provide you with site specific commercial ramps that meet your design criteria and code requirements, online ordering for commercial wheelchair ramps is not available. 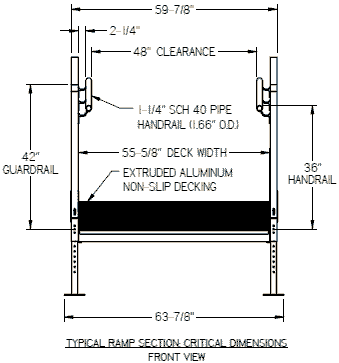 Please call 1-877-258-7423 for a quote or with help configuring your ramp. We accept purchase orders from established commercial entities. Large ramp orders may require a deposit when ordering. Please call us at 1-877-258-7423 to discuss your specific needs and to obtain a written quote for your project. We can help you with the design of your wheelchair ramp and insure that it meets your local & federal ADA requirements at the lowest possible price.